Then the leading priests and Pharisees called the high council together. "What are we going to do?" they asked each other. "This man certainly performs many miraculous signs. If we allow him to go on like this, soon everyone will believe in him. Then the Roman army will come and destroy both our Temple and our nation." What do you value most in your life? What do you have the greatest trouble relinquishing to the lordship of Christ? These two questions are crucial because they help define the battleground on which you will have to fight the adversary. He will do everything he can to distort those values and have them displace the will of God in your heart. The Temple was important to Jewish life, but not more important than the will of God. The Scriptures were essential to God's people, but not more important than God's Messiah. The religious leaders were important to Jewish heritage, but never more important than Israel's true King, God! 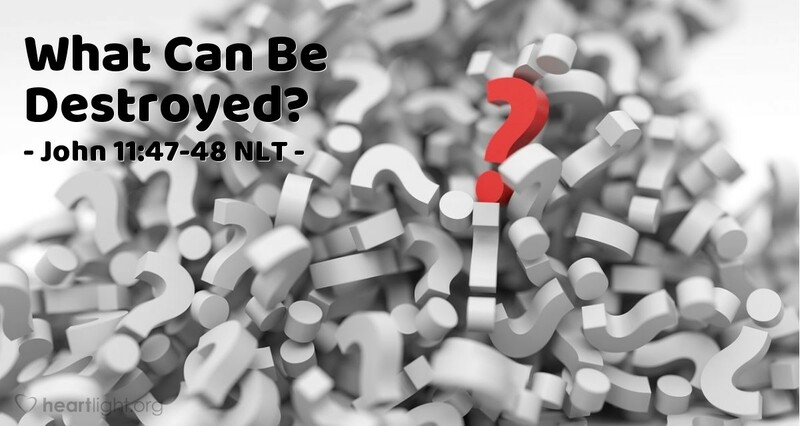 The Pharisees and high council were so intent on keeping what they had that they rejected what God wanted and what he planned for their blessing. They couldn't even see the good things Jesus did because their true treasure was in what they had and not in the God they served. What about us? Purify my heart, O God, and renew a right attitude in me. Cleanse me from my sin and guard me against competing distractions that could become an idol for me. I want no claim upon my heart other than your will for me. Keep my heart, soul, and mind in devotion to you and to the work of your Kingdom. In Jesus' name, I pray. Amen.